The Flappy Bird clones just keeps on dominating the itunes app store, this time, a fishy version is on top. 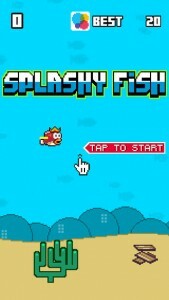 Called Splashy Fish – The Adventure of a Flappy Tiny Bird Fish, it’s hardly much different than the simplistic original. For those counting, this app does come with the following upgrades: Golden Wing, King of the Ocean Crown, Shining Beak, Dark Knight Suite, and Rockstar Glasses. There’s also 8 bit sound effects if you use 3 fingers to tap tap tap your fish through the pipes.